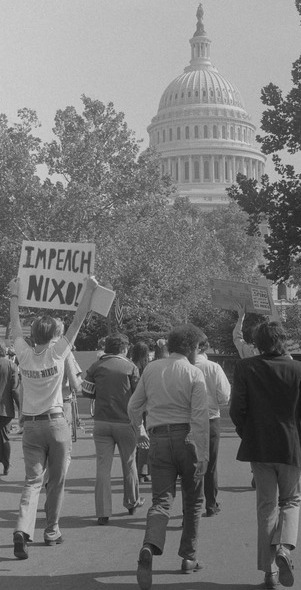 ... 1974, felled by revelations about his role in the Watergate scandal, which had been brewing for months in the media, in street demonstrations (left), and in hearings in Congress, Richard M. Nixon resigned as President, the 1st time this had ever happened in the history of the United States. Nixon "announced his departure last night in the face of an imminent impeachment trial - and possible removal from office," the BBC reported. Sworn in to replace him was Vice President Gerald Ford; almost 10 months to the day earlier, Ford had been appointed Veep following the resignation in disgrace of Nixon's original running mate, Spiro Agnew. This too set a precedent, as the BBC noted: "Mr Ford became the first president to come into office without a single vote being cast in his favour."